According to reports in Spain,Atletico Madrid forward Antoine Griezmann has opted to stay at the club, rejecting the chance to join Barcelona this summer. The French international is currently preparing for the World Cup in Russia where he will be hoping to follow up his Europa League success with a triumph on the international stage. A superb season for Griezmann has seen him linked with Barcelona, who have been largely keen due to his form and connections with fellow countrymen Ousmane Dembele and Samuel Umtiti. Whilst a move has been heavily reported in Spanish press, it is now understood that the former Real Sociedad man has turned down an approach and opted to remain with Atleti past the summer. 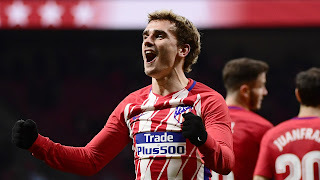 Griezmann confirmed after Friday night’s friendly against Italy that he will confirm his future decision ahead of this summer’s World Cup and it appears increasingly likely he will remain with Diego Simeone’s side.